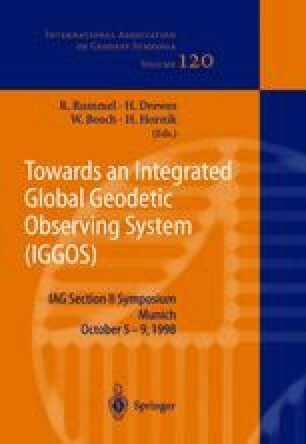 In cooperation with various organizations in the host countries, the GFZ Potsdam established the large-scale GPS network SAGA (South American Geodynamic Activities) covering Chile and parts of Argentina. The network consists of 215 sites including two sites on the islands Robinson Crusoe and San Felix that are part of the Nazca plate. The GPS data were processed with the GFZ Software EPOS resulting in a station coordinates repeatability of 1 – 3 mm horizontally and 5 mm vertically. We processed the SAGA data simultaneously with data of the IGS station network to transform the SAGA network into the ITRF96 frame. Doing this, we computed global solutions with about 20 globally distributed IGS stations and regional solutions with IGS stations in South America. The mean station coordinate residuals for the globally distributed IGS stations between the SAGA solution and the ITRF96 coordinates are 1cm horizontally and 1 – 2 cm vertically. With respect to the South American reference frame the mean station coordinates residuals are in the range of 2 – 5 mm horizontally and below 1 cm for the height. The residual motions for five IGS stations located on the stable part of South America are 1 – 3 mm/yr.